The recent global financial crisis has intensified concerns over how nations-both developed and developing - can revitalize economic growth and ensure opportunity for prosperity to all citizens. Many analysts and policymakers alike are looking to new business creation and the promotion of entrepreneurial practices as a panacea, or at least as a partial solution. A. Coskun Samli has argued in his two most recent books that the current model of globalization tends to marginalize the poor and that developing countries must rely on local business development, rather than exogenous forces, such as aid, loans, and trade, to catalyze growth. This third book in his trilogy argues that a "bottom-up" approach is necessary for developing countries to participate in globalization-but is not sufficient. He proposes that the economic goals of a country, a region, or a company are fulfilled first and foremost by a properly designed and maintained infrastructure, encompassing both physical elements, such as transportation and communication systems, and qualitative elements, such as functioning educational, legal, and governing institutions. In Infrastructuring , Samli analyzes the experiences of a variety of countries, including China, India, Ireland, and South Africa, to highlight the role that infrastructure plays in economic development, and considers its implications for such timely issues as new business creation, productivity, and supply chain logistics. 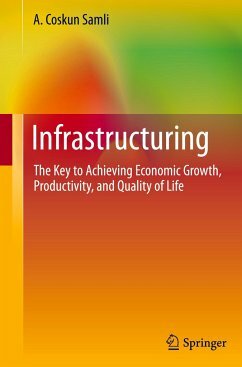 Moreover, he outlines practical approaches to infrastructure management and policy oversight.